Delivery.com is exactly what it sounds like. The easiest possible name to remember for a food delivery service. Search, order, and pay online, and wait for your food. Easy peasy. 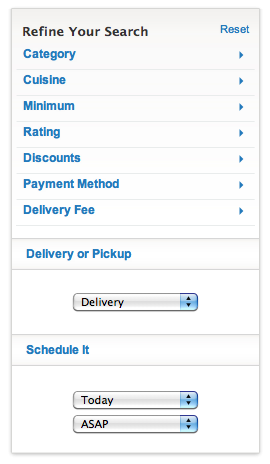 When the folks at delivery.com asked me to review their services, I knew a time would come when I'd need it. On this particular night, the BF and I needed some good eats but had to stay home, where the cupboards were bare. So we entered his address and browsed the many, MANY restaurants that delivered to his area. From the get go, the website was extremely easy to navigate. 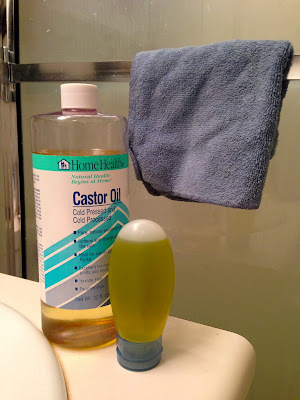 I didn't have to waste any time figuring out how it worked or where to click. First you enter your location (pictured above) and then you can refine your search by cuisine (over 50 different options! ), rating, delivery fee, minium, etc. Very helpful! Then browse the options, select a restaurant, and view the menu. The menu is also easy to read, prices and all. Hovering your mouse over the menu item will reveal a more detailed explanation of what the item is. Then you select, type in any special requests, and place your order! Depending on the restaurant's preferences, you can pay online by card or in cash. We paid online, received our confirmation email, and waited for the buzzer. Our food arrived in about 30 minutes - easy and done. The bag included napkins and plastic utensils. Just what we needed! Can sort lists by merchant name, distance, rating, order minimum, or discounts. Starts with your address, ensuring that your results will deliver to you, at the selected time. Allows for immediately delivery OR to place an order for later. It's more than just food! Categories include: restaurants, caterers, groceries, wine & liquor, flowers & gifts, pet supplies, bakeries & desserts, butcher shops, and office supplies. Allow searching for multiple cuisines at once. 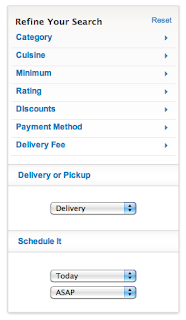 Display the expected delivery time before placing the order. Overall, a positive experience! 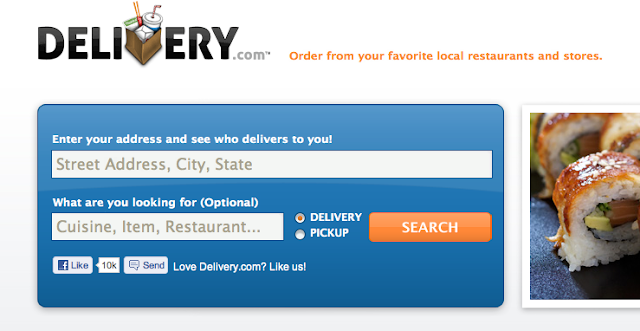 Next time I'm in a bind and need food delivered, I'll likely go straight to Delivery.com. Easy to remember, simple to use. 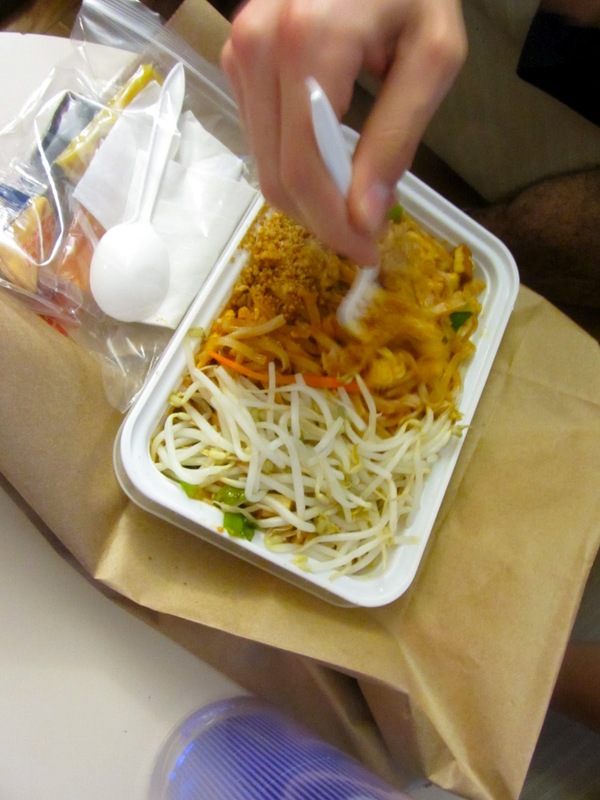 What's your favorite way to do takeout/delivery? A certain website? call? go get it yourself? Disclosure: Delivery.com gave me a $10 coupon code for my first order as a basis for this review. The thoughts and opinions expressed are my own.